Monthly Review | Can Ecological Agriculture Feed Nine Billion People? Can Ecological Agriculture Feed Nine Billion People? Jules Pretty is professor of environment and society at the University of Essex, UK. Something is wrong with our agricultural and food systems.1 Despite great progress in increasing productivity in the last century, hundreds of millions of people remain hungry and malnourished. Further hundreds of millions eat too much, or consume the wrong sorts of food, and it is making them ill. The health of the environment suffers too, as degradation of soil and water seems to accompany many of the agricultural systems we have developed in recent years. Can nothing be done, or is it time for the expansion of an agriculture founded more on ecological principles and in harmony with people, their societies, and cultures? As we advance into the second decade of the twenty-first century, we have some critical choices. Humans have been farming for some 600 generations, and for most of that time the production and consumption of food has been intimately connected to cultural and social systems. Yet, over the last two or three generations, we have developed hugely successful agricultural systems based largely on industrial principles. These systems produce more food per hectare and per worker than ever before, but only look efficient if the harmful side-effects—the use of fossil fuels, the loss of soil health, the damage to biodiversity, the pollution of water and air, the harm to human health caused by agricultural pesticides on food and in the environment, and the development of antibiotic-resistant bacteria in large-scale animal production facilities—are ignored. Recent advances in aggregate productivity have only brought limited reductions in the incidence of hunger. There are more than 1 billion people hungry and lacking adequate access to food. However, there has been progress, since less than one sixth of the world’s population is considered under-nourished today, as opposed to one quarter in 1970. Since then, average per capita consumption of food has increased by 17 percent to 2,760 kilocalories per day—good as an average, but still hiding the fact that many people are surviving on less: thirty-three countries, mostly in Sub-Saharan Africa still have per capita food consumption under 2,200 kcal per day. The challenge remains huge. A further sign that something is wrong is that one in seven people in industrialized countries are now clinically obese, and that five of the ten leading causes of death are diet-related. Alarmingly, the obese are outnumbering the thin in a number of developing countries. As total population continues to increase, so the absolute demand for food will also increase. Increasing incomes will mean people will have more purchasing power, and this will increase demand for food. But as diets change, so demand for certain types of food will also shift radically. Increasing urbanization means people are more likely to adopt new diets, particularly consuming more meat and fewer traditional cereals and other foods. In theory, there is enough staple food produced worldwide to feed everyone adequately, but much is fed to animals (37 percent of cereals in developing countries, 73 percent in industrialized countries), and much is wasted in the upper levels of the social pyramid by the food rich. All commentators agree that food production will have to increase substantially in the coming years. But there are very different views about how this should best be achieved. Some say agriculture will have to expand into new lands—but this will mean further loss of biodiversity. Others say food production growth must come through redoubled efforts to repeat the approaches of the Green Revolution, using high-yielding varieties and large amounts of purchased inputs such as fertilizers and pesticides. Still others say that agricultural sustainability through the use of more ecologically sound methods offers options for farmers to intensify their land use and increase food production. But solving the persistent hunger problem is not simply a matter of developing new agricultural technologies and practices. Most poor producers cannot afford expensive technologies. They will have to find new types of solutions based on locally available and/or cheap technologies combined with making the best of natural, social, and human resources. Intensification using natural, social, and human assets, combined with the use of best available technologies and inputs (best genotypes [varieties] and best ecological management) that minimize or eliminate harm to the environment, can be termed “sustainable intensification.” Although farmers throughout history have used a wide range of technologies and practices that we would today call sustainable, it is only in recent decades that the concepts associated with sustainability have come into more common use. The signing of the Convention on Biological Diversity in 1995. The establishment of the UN Global Integrated Pest Management Facility in 1995, which provides international guidance and technical assistance for integrated pest management. The signing of the Stockholm Convention on Persistent Organic Pollutants in 2001, which addressed some problematic pesticides. The World Summit on Sustainable Development (Johannesburg, 2002). The concept of agricultural sustainability has grown from an initial focus on environmental aspects to include, first, economic and then broader social and political dimensions. What, then, do we now understand by agricultural sustainability? Many different approaches have emerged to advance greater sustainability over both pre-industrial and industrialized agricultural systems. These include biodynamic, community-based, ecoagriculture, ecological, environmentally sensitive, extensive, farm-fresh, free-range, low-input, organic, permaculture, sustainable, and wise-use. There is continuing debate about whether agricultural systems described by these various terms qualify as truly sustainable. The idea of agricultural sustainability, though, does not mean ruling out any technologies or practices by fiat. If a technology works to improve productivity for farmers, and does not cause undue harm to the environment, then it is likely to have some sustainability benefits. Agricultural systems emphasizing these principles also tend to have a number of functions within landscapes and economies. They jointly produce food and other goods for farmers and markets, but also contribute to a range of valued public goods, such as clean water, wildlife, and habitats for beneficial organisms, carbon sequestration in the soil, flood protection, groundwater recharge, landscape amenity value, and leisure/tourism. As a more sustainable agriculture seeks to make the best use of nature’s goods and services, so technologies and practices must be locally adapted and fitted to place. These are most likely to emerge from new configurations, comprising relations of trust embodied in new social organizations, and new horizontal and vertical partnerships between institutions, and human leadership, ingenuity, management skills, and capacity to innovate. Agricultural systems with high levels of social and human assets are more able to innovate in the face of uncertainty such as variable climate or changes in society’s need for particular products. This suggests that there are likely to be many pathways toward agricultural sustainability, and further implies that no single configuration of technologies, inputs, and ecological management is more likely to be widely applicable than another. Agricultural sustainability implies the need to fit these factors to the specific circumstances of different agricultural systems, climates, soils, and social considerations. Agricultural sustainability emphasizes the potential dividends that can come from making the best use of the genotypes (G) of crops and animals and the agro-ecological (AE) conditions under which they are grown or raised. The outcome is a result of the G x AE interaction. Agricultural sustainability suggests a focus on both genotype improvements through the full range of modern biological approaches, as well as improved understanding of the benefits of ecological and agronomic management, manipulation, and redesign. But converting a farming system to a more sustainable design is complex, and generally requires a landscape or bioregional approach to restoration or management. An agroecosystem on a particular farm is designed to produce food and fiber, yet while the farm is the unit of production, it is also part of a wider landscape at which scale a number of ecosystem functions are important. For sustainability, interactions need to be developed between agroecosystems and whole landscapes of other farms and non-farmed or wild habitats (e.g., wetlands, woods, riparian habitats), as well as social systems of food procurement. Mosaic landscapes with a variety of farmed and non-farmed habitats are known to be good for birds and other wildlife as well as farms. Integrated pest management, which uses prevention through developing ecosystem resilience and diversity for pest, disease, and weed control, and only uses pesticides when other options are ineffective. Integrated nutrient management, which seeks both to balance the need to fix nitrogen within farm systems with the need to import inorganic and organic sources of nutrients, and to reduce nutrient losses through control of runoff and erosion. Conservation tillage, which reduces the amount of tillage, sometimes to zero, so that soil can be conserved through reduced erosion, and available moisture is used more efficiently. Cover crops, which grow in the off-season or along with main crops, help protect soil from erosion, manage nutrients and pests, maintain healthy soil, enhance water infiltration and storage in soil. Agroforestry, which incorporates multifunctional trees into agricultural systems, and collectively manages nearby forest resources. Aquaculture, which incorporates fish, shrimp, and other aquatic resources into farm systems, such as irrigated rice fields and fish ponds, and so leads to increases in protein production. Water harvesting in dryland areas, which can mean that formerly abandoned and degraded lands can be cultivated, and additional crops can be grown on small patches of irrigated land, owing to better rainfall retention. Livestock reintegration into farming systems, such as the raising of dairy cattle, pigs, and poultry, including using both grazing and zero-grazing cut-and-carry systems. Mixed crop-livestock systems provide many synergies that enhance production and allow for better nutrient cycling on farms. The individual practices are focused on growing healthy plants with good defense capabilities, enhancing beneficial organisms and stressing pests, while maintaining or enhancing environmental quality. They contribute to better management of habitat—above- and belowground—by incorporating the strengths of natural ecosystems. Many of these individual technologies or practices have multiple functions. Thus, their adoption should mean favorable changes in several components of the farming system at the same time. For example, hedgerows and alley crops encourage predators of pests and act as windbreaks, thus reducing soil erosion by wind. Legumes introduced into rotations fix nitrogen, and also act as a break crop to prevent carryover of insect pests and diseases. Grass contour strips slow surface water runoff, encourage percolation to groundwater, and can be a source of fodder for livestock. Cover crops prevent soil erosion and leaching during critical periods, and can also be ploughed in as a green manure. The incorporation of green manures not only provides a readily available source of nutrients for the growing crop but also increases soil organic matter, and hence water retentive capacity, further reducing susceptibility to erosion. Although many resource-conserving technologies and practices are currently being used, the total number of farmers using them worldwide is still relatively small. This is because their adoption is not a costless process for farmers. They cannot simply cut their existing use of fertilizer or pesticides and hope to maintain outputs, thereby making operations more profitable. They also cannot introduce a new productive element into their farming systems, and hope it succeeds. The transition costs arise for several reasons. Farmers must first invest in learning. Recent and current policies have tended to promote specialized, non-adaptive systems with a lower innovation capacity, so farmers have to spend time learning about a greater diversity of practices and measures. Lack of information and management skills is, therefore, a major barrier to the adoption of sustainable agriculture. During the transition period, farmers must experiment more, and incur the costs of making mistakes as well as of acquiring new knowledge and information. At the same time, new technologies often require more labor. If productivity falls with the adoption of more sustainable agroecosystems, then more land would be required to produce the same amount of food, thus resulting in further environmental degradation as ecologically important ecosystems are converted to cropland. As indicated earlier, the challenge is to seek sustainable intensification of all resources, in order to improve food production. There are now some 3 million hectares of agricultural land in Europe, managed with certified organic practices. Some have led to lower energy use (though lower yields, too); others to better nutrient retention; some greater nutrient losses; and most to greater labor use. Many other farmers have adopted integrated farming practices, which represent a step or several steps toward sustainability. What has become increasingly clear is that many modern specialized farming systems are wasteful, as farmers with more complex, integrated systems have found they can cut down many purchased inputs without losing out on profitability or even yields. Some of these cuts in use are substantial; others are relatively small. By adopting better targeting and precision methods, there is less wastage and so more benefit to the environment. Farmers can then make greater cuts in input use, once they substitute some regenerative technologies for external inputs, such as legumes for inorganic fertilizers, or better habitats for predators of pests for pesticides. Finally, farmers can replace some or all external inputs entirely over time, once they have developed a new type of farming characterized by new goals and technologies. However, it is in developing countries that some of the most significant progress toward sustainable agroecosystems has been made in the past decade. The largest study comprised an analysis of 286 projects in fifty-seven countries that had been implemented by a wide range of government, nongovernment, and international organizations. This involved the use of both questionnaires and the published reports of these projects to assess changes over time. Data were triangulated from several sources, and cross-checked by external reviewers and regional experts. The study involved analysis of projects sampled once in time and those sampled twice over a four-year period. Not all proposed cases were accepted for the dataset. Rejections were based on a strict set of criteria. As this was a purposive sample of “best practice” initiatives, the findings are not representative of all developing country farms. Table 1 contains a summary of the location and extent of the 286 agricultural sustainability projects across the eight categories of the UN Food and Agriculture Organization (FAO) farming systems in the fifty-seven countries. In all, some 12.6 million farmers on 37 million hectares were engaged in transitions toward agricultural sustainability in these 286 projects. This is just over 3 percent of the total cultivated area (1.136 million hectares) in developing countries. The largest number of farmers was in wetland rice-based systems, mainly in Asia (category 2), and the largest area was in mixed systems, mainly in southern Latin America (category 6). This study showed that agricultural sustainability was spreading to more farmers and hectares. In the sixty-eight randomly re-sampled projects from the original study, there was a 54 percent increase over the four years in the number of farmers, and a 45 percent increase in the number of hectares. Improvements in food production were occurring through one or more of four different mechanisms. Intensification of a single component of farm system, with little change to the rest of the farm, such as home garden intensification with vegetables and/or tree crops, vegetables on rice field embankments, and introduction of fish ponds or a dairy cow. 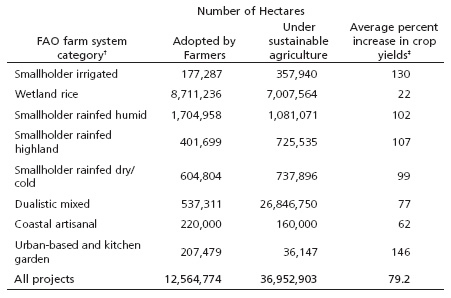 † Farm categories from J. Dixon, A. Gulliver, and D. Gibbon, Farming Systems and Poverty (Rome: United Nations Food and Agriculture Organization, 2001). ‡ Yield data from 360 crop-project combinations; reported as percent increase (thus a 100 percent increase is a doubling of yields). Addition of a new productive element to a farm system, such as fish or shrimp in paddy rice, or agroforestry, which provides a boost to total farm food production and/or income, but which does not necessarily affect cereal productivity. Better use of nature to increase total farm production, especially water (by water harvesting and irrigation scheduling) and land (by reclamation of degraded land), leading to additional new dryland crops and/or increased supply of water for irrigated crops, and thus increasing cropping intensity. Improvements in per hectare yields of staples through the introduction of new regenerative elements into farm systems, such as legumes and integrated pest management, and new and locally-appropriate crop varieties and animal breeds. Thus, a successful sustainable agriculture project may substantially improve domestic food consumption or increase local food barters or sales through home gardens or fish in rice fields, or better water management, without necessarily affecting the per hectare yields of cereals. Home garden intensification occurred in a fifth of projects, but, given its small scale, accounted for less than 1 percent of the area. Better use of land and water, giving rise to increased cropping intensity, occurred in a seventh of projects, with a third of farmers and a twelfth of the area. The incorporation of new productive elements into farm systems, such as fish and shrimp in paddy rice, occurred in 4 percent of projects, and accounted for the smallest proportion of farmers and area. The most common mechanisms were yield improvements with regenerative technologies or new seeds/breeds, occurring in 60 percent of the projects, by more than half of the farmers and on about 90 percent of the area. These aggregate figures understate the benefits of increased diversity in the diet as well as increased quantity. Most of these agricultural sustainability initiatives have seen increases in farm diversity. In many cases, this translates into increased diversity of food consumed by the household, including fish protein from rice fields or fish ponds, milk and animal products from dairy cows, poultry, and pigs kept in the home garden, and vegetables and fruit from home gardens and farm microenvironments. Although these initiatives are reporting significant increases in food production, some as yield improvements, and some as increases in cropping intensity or diversity of produce, few are reporting surpluses of food being sold to local markets. This is because of a significant elasticity of consumption among rural households experiencing any degree of food insecurity. As production increases, so does domestic consumption, with direct benefit particularly for the health of women and children. When rural people eat more food and a greater diversity of food, it does not show up in international statistics that measure the commercial economy. What we do not know, however, is the full economic benefits of these spinoffs. In many industrialized countries, agriculture is now assumed to contribute very little to the GDP, leading many commentators to assume that agriculture is not important for modernized economies. But such a conclusion is a function of the fact that too few measures are being made of the positive side-effects of agriculture. In poor countries, where financial support is limited and markets often weak, people rely even more on the value they can derive from the natural environment and from working together with each other and the environment to achieve collective outcomes, as opposed to market-based activities. Sustainable agriculture systems appear to become more productive when human capacity increases, particularly in the form of farmers’ capacity to innovate and adapt their farm systems for sustainable outcomes. Sustainable agriculture is not a concretely defined set of technologies, nor is it a simple model or package to be widely applied or fixed with time. It needs to be conceived of as a process for social learning. Lack of information about agroecology and necessary skills to manage complex farms is a major barrier to the adoption of sustainable agriculture. One problem is that we know much less about these resource-conserving technologies than we do about the use of external inputs in modernized, more industrial agricultural systems. (Most of the agricultural research in developed countries has been focused on products used for input-intensive systems such as fertilizers, pesticides, new genetics, and new machinery—products that could be sold to farmers.) It is clear that the process by which farmers learn about technology alternatives is crucial. If farmers are forced or coerced, then they may only adopt for a limited period. But if the process is participatory and enhances farmers’ ecological literacy of their farms and resources, then the foundation for redesign and continuous innovation is laid. At this time we are neither feeding all the 6.7 billion people in the world nor—with some notable exceptions—conducting agriculture in an environmentally sound way. It may be possible to feed the estimated 9 billion people living on earth by mid-century. However, this will take a massive and multifaceted effort that may include changing the way animals are raised (not feeding ruminants food that could be used for human consumption) and giving up the ill-conceived use of cereals and other foods for conversion to transport fuels. In addition, support is needed for the development of participatory groups of farmers that can try out a variety of practices and learn from each other as well as technicians as they explore new techniques that will enhance sustainability. We need to begin this project today. ↩ For further documentation of this essay, see Jules Pretty, Agri-Culture (London: Earthscan, 2002); Jules Pretty, ed., The Earthscan Reader in Sustainable Agriculture (London: Earthscan, 2005); Jules Pretty, The Earth Only Endures (London: Earthscan, 2007). ↩ World Commission on Environment and Development, Our Common Future (New York: Oxford University Press: 1987), 43, 52, 89. ↩ Raj Patel, Eric Holt-Gimenez, and Annie Shattuck, “Ending Africa’s Hunger,” The Nation, September 2, 2009.